The Atomic Age, also known as the Atomic Era, is the period of history following the detonation of the first nuclear ("atomic") bomb, Trinity, on July 16, 1945, during World War II. Although nuclear chain reactions had been hypothesized in 1933 and the first artificial self-sustaining nuclear chain reaction had taken place in December 1942, the Trinity test and the ensuing bombings of Hiroshima and Nagasaki that ended World War II represented the first large-scale use of nuclear technology and ushered in profound changes in sociopolitical thinking and the course of technology development. 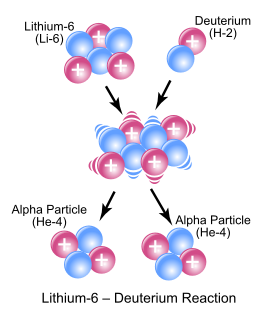 In nuclear physics and nuclear chemistry, a nuclear reaction is semantically considered to be the process in which two nuclei, or else a nucleus of an atom and a subatomic particle from outside the atom, collide to produce one or more nuclides that are different from the nuclide(s) that began the process. Thus, a nuclear reaction must cause a transformation of at least one nuclide to another. If a nucleus interacts with another nucleus or particle and they then separate without changing the nature of any nuclide, the process is simply referred to as a type of nuclear scattering, rather than a nuclear reaction. Radium is a chemical element with symbol Ra and atomic number 88. It is the sixth element in group 2 of the periodic table, also known as the alkaline earth metals. 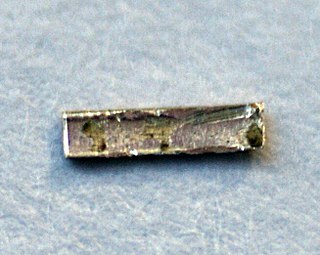 Pure radium is silvery-white, but it readily reacts with nitrogen (rather than oxygen) on exposure to air, forming a black surface layer of radium nitride (Ra3N2). All isotopes of radium are highly radioactive, with the most stable isotope being radium-226, which has a half-life of 1600 years and decays into radon gas (specifically the isotope radon-222). When radium decays, ionizing radiation is a product, which can excite fluorescent chemicals and cause radioluminescence. 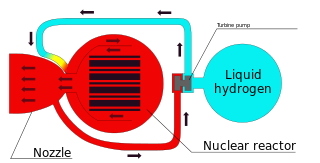 Pressurised water reactors are the most common reactors used in ships and submarines. The pictorial diagram shows the operating principles. Primary coolant is in orange and the secondary coolant (steam and later feedwater) is in blue. A submarine is a watercraft capable of independent operation underwater. It differs from a submersible, which has more limited underwater capability. The term most commonly refers to a large, crewed vessel. It is also sometimes used historically or colloquially to refer to remotely operated vehicles and robots, as well as medium-sized or smaller vessels, such as the midget submarine and the wet sub. The noun submarine evolved as a shortened form of submarine boat; by naval tradition, submarines are usually referred to as "boats" rather than as "ships", regardless of their size. 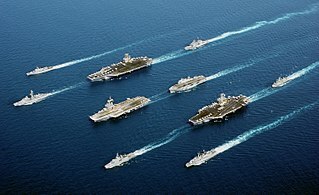 A nuclear navy, or nuclear-powered navy, refers to the portion of a navy consisting of naval ships powered by nuclear marine propulsion. The concept was revolutionary for naval warfare when first proposed. 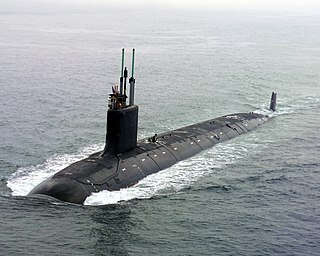 Prior to nuclear power, submarines were powered by diesel engines and could only submerge through the use of batteries. In order for these submarines to run their diesel engines and charge their batteries they would have to surface or snorkel. The use of nuclear power allowed these submarines to become true submersibles and unlike their conventional counterparts, they became limited only by crew endurance and supplies. JASON is an independent group of elite scientists which advises the United States government on matters of science and technology, mostly of a sensitive nature. The group was first created as a way to get a younger generation of scientists—that is, not the older Los Alamos and MIT Radiation Laboratory alumni—involved in advising the government. It was established in 1960 and has somewhere between 30 and 60 members. Its work first gained public notoriety as the source of the Vietnam War's McNamara Line electronic barrier. Although most of its research is military-focused, JASON also produced early work on the science of global warming and acid rain. Current unclassified research interests include health informatics, cyberwarfare, and renewable energy. A picture of an Aircraft Nuclear Propulsion system, known as HTRE-3(Heat Transfer Reactor Experiment no. 3). The central EBR-1 based reactor took the place of chemical fuel combustion to heat the air. The reactor rapidly raised the temperature via an air heat exchanger and powered the dual J47 engines in a number of ground tests. Research into nuclear-powered aircraft was pursued during the Cold War by the United States and the Soviet Union as they would presumably allow a country to keep nuclear bombers in the air for extremely long periods of time, a useful tactic for nuclear deterrence. Neither country created any operational nuclear aircraft. One design problem, never adequately solved, was the need for heavy shielding to protect the crew from radiation sickness. Since the advent of ICBMs in the 1960s the tactical advantage of such aircraft was greatly diminished and respective projects were cancelled. Because the technology was inherently dangerous it was not considered in non-military contexts. Nuclear-powered missiles were also researched and discounted during the same period. Many types of nuclear propulsion have been proposed, and some of them (e.g. NERVA) tested for spacecraft applications. External Pulsed Plasma Propulsion (EPPP), a propulsion concept by NASA that derives its thrust from plasma waves generated from a series of small, supercritical fission/fusion pulses behind an object in space. Bimodal Nuclear Thermal Rockets - conduct nuclear fission reactions similar to those employed at nuclear power plants including submarines. The energy is used to heat the liquid hydrogen propellant. The vehicle depicted is the "Copernicus" an upper stage assembly being designed for the Space Launch System (2010). Project Rover - an American project to develop a nuclear thermal rocket. The program ran at the Los Alamos Scientific Laboratory from 1955 through 1972. Bussard ramjet, a conceptual interstellar fusion ramjet named after Robert W. Bussard. Anatolij Perminov, head of the Russian Federal Space Agency, announced[ when? ] that it is going to develop a nuclear-powered spacecraft for deep space travel. Preliminary design was done by 2013, and 9 more years are planned for development (in space assembly). The price is set at 17 billion rubles (600 million dollars). The nuclear propulsion would have mega-watt class,   provided necessary funding, Roscosmos Head stated. In 1958 at the height of the 1950s American automobile culture there were at least four theoretical nuclear-powered concept cars proposed, the American Ford Nucleon and Studebaker Packard Astral, as well as the French Simca Fulgur designed by Robert Opron   and the Arbel Symétric. Apart from these concept models, none were built and no automotive nuclear power plants ever made. Chrysler engineer C R Lewis had discounted the idea in 1957 because of estimates that an 80,000 lb (36,000 kg) engine would be required by a 3,000 lb (1,400 kg) car. His view was that an efficient means of storing energy was required for nuclear power to be practical. Despite this, Chrysler's stylists in 1958 drew up some possible designs. Ford made another potentially nuclear-powered model in 1962 for the Seattle World's Fair, the Ford Seattle-ite XXI. This also never went beyond the initial concept. Interstellar travel is the term used for crewed or uncrewed travel between stars or planetary systems. 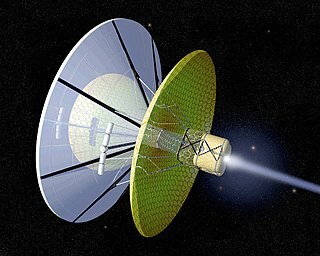 Interstellar travel will be much more difficult than interplanetary spaceflight; the distances between the planets in the Solar System are less than 30 astronomical units (AU)—whereas the distances between stars are typically hundreds of thousands of AU, and usually expressed in light-years. Because of the vastness of those distances, interstellar travel would require a high percentage of the speed of light; huge travel time, lasting from decades to millennia or longer; or a combination of both. A nuclear salt-water rocket (NSWR) is a theoretical type of nuclear thermal rocket which was designed by Robert Zubrin. In place of traditional chemical propellant, such as that in a chemical rocket, the rocket would be fueled by salts of plutonium or 20 percent enriched uranium. The solution would be contained in a bundle of pipes coated in boron carbide. Through a combination of the coating and space between the pipes, the contents would not reach critical mass until the solution is pumped into a reaction chamber, thus reaching a critical mass, and being expelled through a nozzle to generate thrust. In a traditional nuclear photonic rocket, an onboard nuclear reactor would generate such high temperatures that the blackbody radiation from the reactor would provide significant thrust. The disadvantage is that it takes a lot of power to generate a small amount of thrust this way, so acceleration is very low. The photon radiators would most likely be constructed using graphite or tungsten. Photonic rockets are technologically feasible, but rather impractical with current technology based on an onboard nuclear power source. However, the recent development of Photonic Laser Thruster (PLT), the Beamed Laser Propulsion (BLP) with photon recycling, promises to overcome these issues by separating the nuclear power source and the spacecraft and by increasing the thrust to nuclear power ratio by orders of magnitude. A fusion rocket is a theoretical design for a rocket driven by fusion propulsion which could provide efficient and long-term acceleration in space without the need to carry a large fuel supply. The design relies on the development of fusion power technology beyond current capabilities, and the construction of rockets much larger and more complex than any current spacecraft. A smaller and lighter fusion reactor might be possible in the future when more sophisticated methods have been devised to control magnetic confinement and prevent plasma instabilities. Inertial fusion could provide a lighter and more compact alternative, as might a fusion engine based on an FRC. The Bussard ramjet is a theoretical method of spacecraft propulsion proposed in 1960 by the physicist Robert W. Bussard, popularized by Poul Anderson's novel Tau Zero, Larry Niven in his Known Space series of books, Vernor Vinge in his Zones of Thought series, and referred to by Carl Sagan in the television series and book Cosmos. The Variable Specific Impulse Magnetoplasma Rocket (VASIMR) is an electrothermal thruster under development for possible use in spacecraft propulsion. It uses radio waves to ionize and heat a propellant. Then a magnetic field accelerates the resulting plasma to generate thrust. It is one of several types of spacecraft electric propulsion systems. Nuclear pulse propulsion or external pulsed plasma propulsion, is a hypothetical method of spacecraft propulsion that uses nuclear explosions for thrust. It was first developed as Project Orion by DARPA, after a suggestion by Stanislaw Ulam in 1947. Newer designs using inertial confinement fusion have been the baseline for most post-Orion designs, including Project Daedalus and Project Longshot. A radioisotope thermoelectric generator is an electrical generator that uses an array of thermocouples to convert the heat released by the decay of a suitable radioactive material into electricity by the Seebeck effect. This generator has no moving parts. Robert W. Bussard was an American physicist who worked primarily in nuclear fusion energy research. He was the recipient of the Schreiber-Spence Achievement Award for STAIF-2004. He was also a fellow of the International Academy of Astronautics and held a Ph.D. from Princeton University. Project Orion was a study of a spacecraft intended to be directly propelled by a series of explosions of atomic bombs behind the craft. Early versions of this vehicle were proposed to take off from the ground with significant associated nuclear fallout; later versions were presented for use only in space. Six tests were launched. Project Prometheus/Project Promethian was established in 2003 by NASA to develop nuclear-powered systems for long-duration space missions. This was NASA's first serious foray into nuclear spacecraft propulsion since the cancellation of the SNTP project in 1995. The project was cancelled in 2005. Its budget shrank from $252.6 million in 2005 to only $100 million in 2006, $90 million of which was for closeout costs on cancelled contracts. The Nuclear Engine for Rocket Vehicle Application (NERVA) was a U.S. nuclear thermal rocket engine development program that ran for roughly two decades. NERVA was a joint effort of the U.S. Atomic Energy Commission (AEC) and NASA, managed by the Space Nuclear Propulsion Office (SNPO) until both the program and the office ended at the end of 1972. Project Longshot was a conceptual interstellar spacecraft design. It would have been an unmanned probe, intended to fly to and enter orbit around Alpha Centauri B powered by nuclear pulse propulsion. An interstellar probe is a space probe that has left—or is expected to leave—the Solar System and enter interstellar space, which is typically defined as the region beyond the heliopause. It also refers to probes capable of reaching other star systems. Gas core reactor rockets are a conceptual type of rocket that is propelled by the exhausted coolant of a gaseous fission reactor. The nuclear fission reactor core may be either a gas or plasma. They may be capable of creating specific impulses of 3,000–5,000 s and thrust which is enough for relatively fast interplanetary travel. Heat transfer to the working fluid (propellant) is by thermal radiation, mostly in the ultraviolet, given off by the fission gas at a working temperature of around 25,000 °C. A thermal rocket is a rocket engine that uses a propellant that is externally heated before being passed through a nozzle, as opposed to undergoing a chemical reaction as in a chemical rocket. Nuclear power in space is the use of nuclear power in outer space, typically either small fission systems or radioactive decay for electricity or heat. Another use is for scientific observation, as in a Mössbauer spectrometer. One common type is a radioisotope thermoelectric generator, which has been used on many space probes and on manned lunar missions, and another is small fission reactors for Earth observation satellites such as the TOPAZ nuclear reactor. A radioisotope heater unit provides heat from radioactive decay of a material and can potentially produce heat for decades. ↑ Thornton, G; Blumbeg, B. (January 1961). "Aircraft Nuclear Propulsion Heat Transfer Reactor Experiments Fulfill Test Goals". Nucleonics. McGraw-Hill. 19 (1). ISSN 0096-6207. ↑ Norris, Guy (14 October 2014). "False Starts For Aviation's Atomic Age". Aviation Week. Retrieved 17 October 2014. ↑ Gady, Franz-Stefan (2 March 2018). "Russia Reveals 'Unstoppable' Nuclear-Powered Cruise Missile". The Diplomat. Retrieved 26 March 2018. ↑ Contact: Gynelle C. Steele (July 15, 2005). "F-22 Raptor Stealth". NASA Glenn's Research & Technology. Retrieved 2009-07-08. ↑ Page, Lewis (5 April 2011). "Russia, NASA to hold talks on nuclear-powered spacecraft. Muscovites have the balls but not the money". The Register. Retrieved 26 December 2013. ↑ (in Russian) Academician Anatoly Koroteev: "Nuclear power can provide a qualitative leap in the development of space"
↑ "Benson Ford poses challenge on atomic powered automobiles". The Brooklyn Daily Eagle. October 2, 1951. p. 3. Retrieved June 4, 2015– via Newspapers.com. ↑ "Radioactive cars of the twentieth century" . Retrieved 26 April 2012. 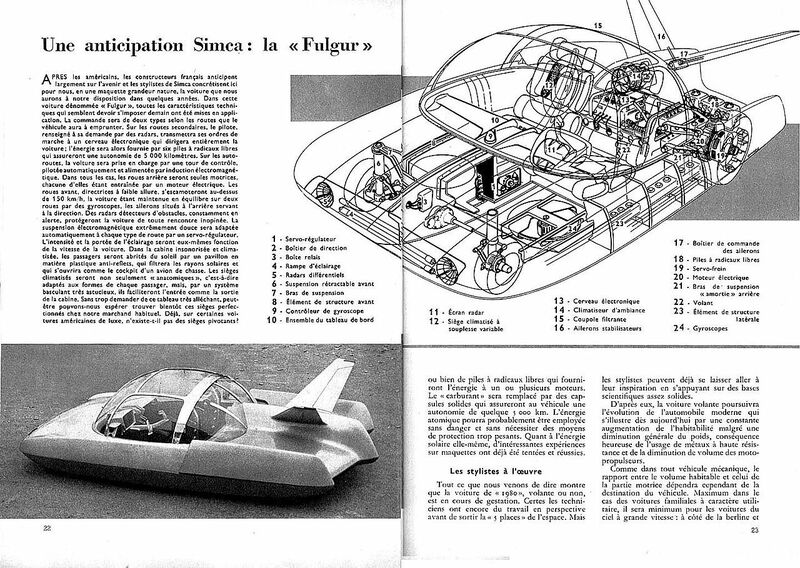 ↑ "Une anticipation Simca : la "fulgur"" (in French). Retrieved 26 April 2012. ↑ Hearst Magazines (April 1957). "The Atom powered carPopular Mechanics". Popular Mechanics. Hearst Magazines. p. 141. ↑ Hanlon, Mike. "Ford Seattle-ite: one of history's most significant concept cars". Gizmag.com. Retrieved 26 April 2012. ↑ "1962 Ford Seattle-ite XXI" . Retrieved 26 April 2012. ↑ WTF? Cadillac World Thorium Fuel Concept? ↑ Hunnicutt 1990, p. 36. ↑ "Multi-Mission Radioisotope Thermoelectric Generator" (PDF). NASA/JPL. January 1, 2008. Archived from the original (PDF) on August 13, 2012. Retrieved August 6, 2012. ↑ "Mars Exploration: Radioisotope Power and Heating for Mars Surface Exploration" (PDF). NASA/JPL. April 18, 2006. Retrieved September 7, 2009. Bussard, R.; DeLauer, R. (1958). "Nuclear Rocket Propulsion". McGraw-Hill. Bussard, R. (1965). "Fundamentals of Nuclear Flight". McGraw-Hill. Cushin, Harry (April 1951). "Atomic Power — In your car". Motor Trend . Wikimedia Commons has media related to Nuclear rocket engines . S. K. Borowski et al., "Nuclear Thermal Rocket/Vehicle Design Options for Future NASA Missions to the Moon and Mars", U. S. National Aeronautics and Space Administration, NASA-TM-0107071, September 1993. W. E. Moeckel, "Propulsion Systems for Manned Exploration of the Solar System," U. S. National Aeronautics and Space Administration, NASA TM X-1864, August 1969. G. R. Schmidt, J. A. Bonometti and P. J. Morton, "Nuclear Pulse Propulsion: Orion and Beyond," Am. Inst. Aero. Astro., AIAA 2000-3856, July 2000.